Located on Briar Creek Way near the intersection of Western Ave and W Central Ave, Extra Space Storage serves residents of Lompoc, Acorn, and Mission Hills. 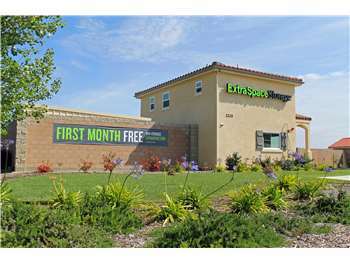 Locals will recognize our facility next to Seabreeze Apartments across from Lompoc Sewage Treatment Plant a few minutes west of Walmart. We're a convenient storage option for active military, base personnel, and military families living at or around Vandenberg AFB! Our Briar Creek Way location is about 8.6 miles away from base. Extra Space Storage on Briar Creek Way offers a large selection of storage units, drive-up access, and exceptional security, making us your ideal storage solution in Lompoc! With unit sizes ranging from 5x5 to 20x20, our Lompoc storage facility can accommodate items large and small! We also have units with features like indoor access, first-floor access, and drive-up access. At Extra Space Storage, we're dedicated to the safety of our customers and their items. That's why our Briar Creek Way storage facility has an on-site resident manager, 24-hour video surveillance, and electronic gate access. Experience the ultimate storage convenience with drive-up access! Units with this amenity make it easy for you to carry large, heavy items to and from your vehicle without having to go through hallways or up stairs. Drive-up units are available in sizes 5x5 to 20x20. With a well-maintained, secure, clean facility and a friendly, professional team, Extra Space Storage is the self storage partner you can count on. We strive to deliver exceptional service, so we're happy to help with whatever you need. Contact us today to reserve a storage unit in Lompoc! The facility is very clean and well maintained. The staff is helpful. The rates are competitive but are subject to increase. Overall a good experience and I would recommend them for anyone. Extremely professional. Super clean units. Very easy to work with.Great customer service. Reasonable rates. Easy access. Great communication with new manager Byron. He made the whole experience a pleasure. He helped pick out the correct size unit for my needs. Thank you Byron. Moving is a stressful situation especially when you have your personal items that you want to take care of during your move. Having friendly and helpful customer service attend to you and provide a clean safe environment for your belongings is essential and am so happy to have chosen Extra Space Storage! I am very grateful to the gentleman who attended me, he was very respectful on the phone and in person. Hw provided options, support, he was caring, courtis, and made us feel at home. I did not feel like he just wanted to close a sell, he cared for our needs and that's hard to find. Thank you for hiring excellent staff! Very helpful staff, clean and tidy yard. Very glad we were able to get a unit there. Very professional staff and clean facility. I was very impressed with the facility. Very clean. Well lit. Secure. The units are easily assessable. The price is lower than most of the run down facilities in the area. Professional staff,clean. Well maintained. Great hours 7 day a week. Security is a must. Pleasant experience from calling to going there and renting a unit. Great location -- right off Central Avenue; staff courteous, professional and helpful; great hours (office and facility); security unrivaled; units clean and well lit; wide alleys for truck access. Highly recommended! Byron at the front desk was very knowledgeable, friendly and helpful! Great location and very knowledgeable staff. The place is kept clean and take security very seriously. 7/5 stars would recommend to others! Great facilities, very clean. Courteous and professional staff that work with you as a client. However, use an email account where you get spam as they send out dumb survey's and clutter your email. Other than that, great place to store your items. Great experience with the staff. Very professional and welcoming! I was comped a lock and key becaus eof the wait time to sign up and get into a unit. Units are very clean and I love the security. It's a little more pricey yet the cleanliness and security are worth it! This storage unit and the people running it make the process very easy. It was a lucky day for me that a right size space for the amount for my things was there for me. The lady there was quite once & accomadating to me. Great place to store items. Staff is very helpful and nice. Storage areas are clean and safe. Definitely recommend. Clean property. Good lighting, accessible hours, friendly staff, good rates, excellent security! I can park directly in front of my space, making access easy. Best place In Lompoc. Best quality around. Great facility, clean, secure and great staff. The Extra Space Storage on Briar Creek Way in Lompoc, CA is new, well maintained and clean. Additionally, their prices are very competitive. However, there are many company policies/rules that seem to be unique to Extra Space Storage and that can make the application to rent a storage unit cumbersome and frustrating. Additionally, those policies seem pretty arbitrary. One example is their requirement that you must either purchase insurance on your stored items from them at an unreasonably high rate or provide proof of insurance through your insurance company. However, in either case, the insurance doesn't have to be enough to cover the value of what is being stored. If storing a vehicle, proof of liability insurance is enough to meet the requirement even though liability insurance provides no coverage on the vehicle being stored. Another issue is when dealing with an incapacitated person's Power of Attorney (POA), they simply don't know how to handle it and make it very difficult for the POA to rent the unit. Once over the hurdles, it is smooth sailing but the hurdles are most frustrating in some cases. It took me great effort, many phone calls and 3 days to get a unit rented (Whew!!! ); hence, the 3-star rating. Otherwise, a 5-star rating would have been given. Best customer service experience ever when dealing with a storage facility. The unit was clean. The Web pricing was very reasonable. Would recommend. Great variety of options. Excellent storage facility. Customer service is great. Staff is very friendly and helpful. The move-in process was very simple and quick. Facility seems very secured with a manager living on-site. I definitely recommend this storage facility. If you're looking for a clean and reasonable priced storage unit this is the place! The overall presentation of the premesis was comforting from the start. The unit was clean, very secure and easy to access with a vehicle. Jessica was extemely helpful in establishing my new account and storage location. I wish this location had been set up sooner!! I have used several Storage Facilities through the years in different cities and states. The Lompoc-Briar Creek facility is by far the BEST. Not only is the facility top-notch and CLEAN, but the staff is wonderful. Felicity ALWAYS has a warm smile and greeting. THANK YOU! Felicia made the experience very easy. Highly recommend this place for your storage needs. Central and Western, Central and V St.
Head south on CA 1 until you reach Central Avenue, make a right and follow Central past Lompoc Drought Tolerant Garden on the right and prepare to make next left onto Western Ave making the immediate left merge and then left onto Briar Creek Way with Extra Space on the corner. Head North on CA 1 (follow CA 1 to 246 West to CA 1 North) until you reach Central Avenue with 7-11 on your left, make a left at light and follow Central Avenue past Lompoc Drought Tolerant Garden on the right and prepare to make next left onto Western Ave making the immediate merge left and then left onto Briar Creek Way with Extra Space on the corner. Take West Central Avenue head east until you have the water treatment plant on your left and take next right onto Western Ave making the immediate merge left and then left onto Briar Creek Way with Extra Space on the corner.